Seasonal spring blooms adorn a newly released Royal Canadian Mint coin that appears poised for a quick sellout. Its maximum mintage is 6,500 and 82% have already sold. 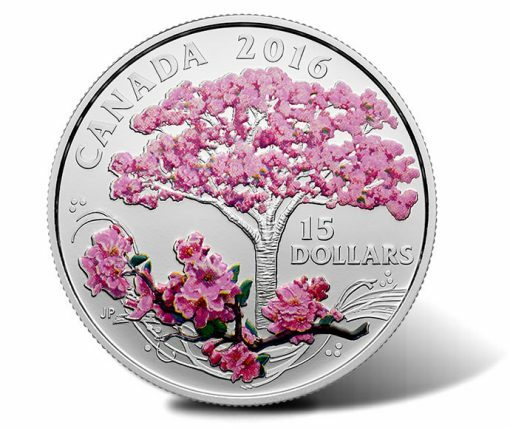 Priced at CAD $64.95, or about US $48.50, each coin is composed of 99.99% pure silver and features a colorful design of a blooming Kwanzan cherry tree. "Delicate shades of pink fill this pure silver coin to breathtaking effect," describes the coin’s product page on the Royal Canadian Mint’s website. "The springtime blossom of the cherry tree is an ancient symbol in Japanese culture that has long been celebrated in poetry and art — and continues to inspire cross-cultural festivals to this day." Many Canadians adore this colorful sign of spring with Vancouver’s famous Cherry Blossom Festival (www.vcbf.ca) celebrating its 10th anniversary this year. Toronto’s High Park also hosts a stand of the trees which serves as a reminder of the ongoing friendship of those in Canada and Japan. Canadian artist Jan Poynter designed the cherry blossom image which adorns the reverse (tails side) of this silver proof coin. Detailed engraving enhances the delicate blossoms, with pink coloring added for effect. Inscriptions of CANADA, 2016 and the legal tender face value of 15 DOLLARS are also featured. Finally, JP is inscribed to the left for the designer. Shown on the obverse (heads side) is the Susanna Blunt effigy of Queen Elizabeth II. 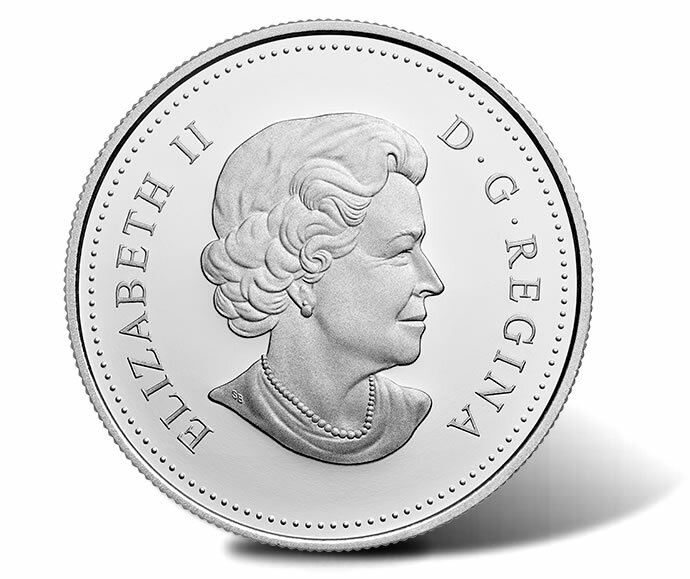 Inscribed around her likeness is ELIZABETH II and D G REGINA. The 2016 Cherry Blossoms Silver Coin is available at mint.ca. The following affiliate link goes to the Mint’s product page for the coin. Each is encapsulated and presented in a Royal Canadian Mint-branded maroon clamshell with beauty box. 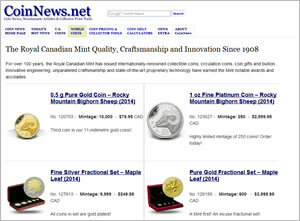 Thanks for this article about a stunningly beautiful coin from the RCM! While I don’t collect colorized coins as a rule (I did buy a few of the RCM 2016 25-cent lenticular 3-D coins with the limited edition collectors cards for my 4 nephews) this coin almost makes me want to break that rule for the first time. I lived in Japan for 3 years & remember seeing them blooming each year there & on 3 visits to Washington D.C. too. The cherry trees (over 3,000) planted along the Potomac River in Washington D.C. were a gift from the government of Japan in 1912 to First Lady Helen Taft & appear on the reverse design of her $10 gold First Spouse coin struck by the U.S. Mint in 2013. Yeah, I wouldn’t blame you for not wanting to leave Texas. I’m surprised we haven’t seen pre-release photos of the NPS coins yet, much less any insight into the 3-coin offering release. The mint has really taken the fun out of the anticipated releases with being so zipped lipped regarding schedule, pre-looks photos, release specifics, etc…. The U.S. Mint released line-art/mock-up versions of the NPS commemorative coins on November 19 at a ceremony in Washington D.C. Then on December 31 on this CoinNews coin blog website Rhonda (Kay) Unser wrote an article with the actual photos of the 3 NPS coins provided by the Mint. 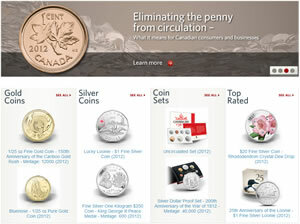 But, for some strange reason, as of today the Mint’s website only has the description of all of these coins & on-sale date information but says “photo unavailable” for all 6 coins (Proof & Uncirculated versions of each denomination.) Not sure why they haven’t used the photos they released to the media in late December on their own website! I just got this coin direct from the cad mint, but noticed marks around the inside, right above and below the second L and also on the left side between the branches. I viewed several coins on ebay with the same marks. These marks were not on the coin on the website. Can anyone tell me if they have noticed the same?